Two down — how many more to go? And when will it all begin? Intrigue about the 2020 Democratic presidential field intensified this week as former Massachusetts Gov. Deval Patrick and celebrity attorney Michael Avenatti both announced they are taking a pass on campaigns, while top party leaders signaled they are putting the final touches on plans for how, when and where to crowd the potentially crowded field of contenders on to a debate stage. Patrick, 62, said in a statement Thursday that he's been "overwhelmed by advice and encouragement from people from all over the country, known and unknown. Humbled, in fact. But knowing that the cruelty of our elections process would ultimately splash back on people whom Diane and I love, but who hadn't signed up for the journey, was more than I could ask." The earlier preparations for debates come after harsh criticism of how the Democratic National Committee (DNC) arranged the format, scheduling and selection process for televised debates. Next week, DNC officials are likely to announce a schedule for the first wave of debates, according to multiple party officials familiar with the plans. Final details are set to be discussed with top donors and members of the DNC at meetings in Washington on Friday and next week, the officials said. The new plan is expected to include a series of traditional multi-candidate debates, and DNC Chairman Tom Perez is said to favor a system that places top-tier, well-known candidates alongside insurgents or upstarts trying to break through. Party officials have openly mulled a kind of public selection process for selecting who appears at which debate that would resemble the televised NBA Draft Lottery or "Selection Shows" used to announce which college football and basketball teams will face each other in the playoffs. One other concept that has been proposed — but not taken as seriously by party leaders — would have the DNC host a series of "meet-and-greet" forums where candidates would deliver remarks to audiences of the party faithful. But the road show-style events aren't seen as feasible, some officials said. Whenever and however debates happen, Patrick and Avenatti won't be there. Patrick, 62, is planning to issue a statement Wednesday that says he will not run for president, according to multiple people familiar with his plans. These people, who were granted anonymity to speak frankly about the governor's plans, said the statement would explain more about his decision. Patrick served as the Bay State governor from 2007 to 2015, and has remained tight with a small cadre of mostly Boston-area consultants who were advising him on his moves. He began telling close associates of his decision on Tuesday, according to a person familiar with the governor's thinking who requested anonymity to speak frankly about private consultations. Patrick is currently a managing director at the private investment firm Bain Capital, the same firm that was the focus of many of the attacks on Republican Mitt Romney, a former company executive, during his 2012 presidential bid. Despite his corporate work, the former governor was considered by many to be a potentially viable 2020 candidate given his past work as a federal prosecutor, his willingness to campaign this year for Democratic congressional candidates and his ties to former president Barack Obama. The pair, who once shared Democratic consultant David Axelrod's services, had spoken in recent months about a potential campaign, according to news reports, part of ongoing meetings Obama has held with several other potential candidates. In a glowing profile recently published by The New Yorker, Patrick said he wanted to campaign this past year in congressional districts "where Democrats had not been competitive in a long time and were running at the grassroots level." The article also retold the governor's rags-to-riches story of growing up on the south side of Chicago, earning a scholarship to an elite Massachusetts prep school and his rise through the Justice Department on his way to the state house. On Tuesday, Avenatti, the attorney representing Stormy Daniels in ongoing legal proceedings against President Trump, announced he will not run after openly toying with the idea on his closely-watched Twitter account, in television interviews, and during trips in recent months the to speak at county and state Democratic Party functions. Avenatti, 47, said in a statement that he took a pass on a presidential campaign "out of respect for my family. But for their concerns, I would run." 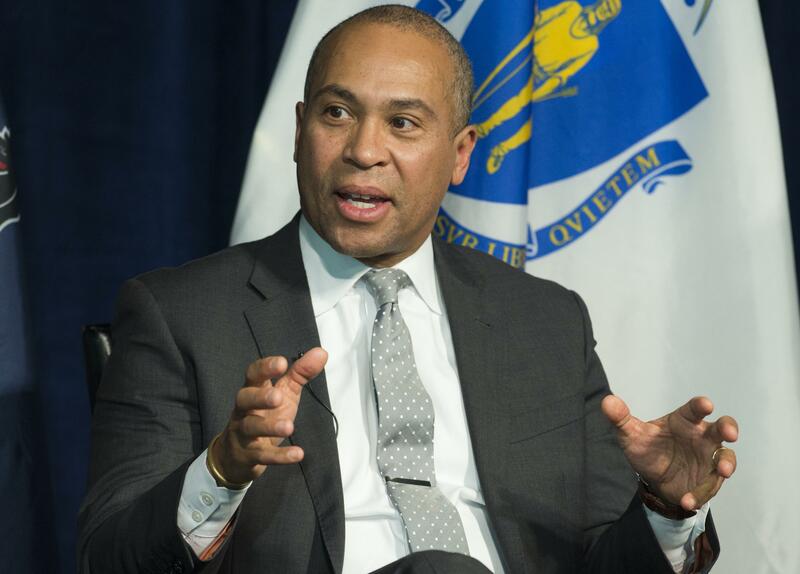 In a tweet late Tuesday, Avenatti said, "If the news about @DevalPatrick is true (I hope it is not), hopefully he will remain open to being a VP pick. He is an exceptional statesman. A good man and one of the most intelligent possible candidates." Other potential Democratic contenders are expected to make final decisions in the coming weeks. Vice President Joe Biden, Los Angeles Mayor Eric Garcetti and Sens. Sherrod Brown of Ohio, California's Kamala Harris and Elizabeth Warren of Massachusetts have all said in recent days that they plan to make a final decision over the holidays. Meanwhile, Sen. Cory Booker, D-New Jersey, is scheduled to make several stops in New Hampshire this weekend as he continues to openly flirt with a bid.